Outlook: A trusty defender for Ross Lyon and now a life member of the club. Duffield has turned 30, but he’s still playing near his peak and has plenty to offer Fremantle with his skill and poise. What the coach says (Michael Prior): He hasn’t missed a beat during the pre-season and is imparting all his knowledge on the younger players so we’re really pleased with how he’s going. 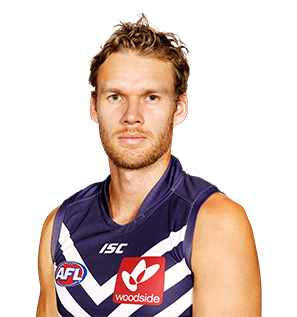 The reliable defender enjoyed a strong season, one that saw him play his 150th game for Fremantle and become eligible for life membership at the club. 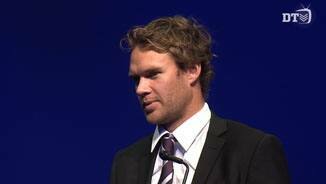 Duffield was cool and collected in Freo’s defence in 2013, as he has been for a number of years now. The quality ball user was often looked to as an avenue out of the backline. Paul Duffield had a strong finish to the 2012 season after a mid-season patch that saw him dropped between rounds 11-14. Duffield went back to South Fremantle, built form and played an important role in the club’s run to the finals, gaining at least 20 disposals in Freo’s last six games of the season. Duffield used the ball very well by foot. He had the most kicks at the club, averaging 14.3 per game, and also leading the effective kicks category with 11.7 a game. This equated to an impressive kicking efficiency of 81.7 per cent, which ranked top 10 in the AFL among players who appeared in at least 13 games. Duffield didn’t have as good a year in 2011 as his excellent 2010 season, but he was still a key player according to the statistical indicators. He averaged 17 disposals, down by four per game from the previous season. This was still good enough for fifth overall at the club for total disposals (354) and he had 79.1 per cent disposal efficiency (fifth overall). Duffield was first at the club in total effective kicks (167) and short kicks (99), and he also came top five in total kicks (217), tackles (86), rebound 50s (63), inside 50s (46) and score assists (16). Looks primed to have a big 2012 season. Duffield had a great season after moving into a midfield role. His ball-winning ability and poise under pressure was a major factor in the improvement of Fremantle’s onball brigade in 2010. Duffield played one of his best games of the season in round 4 against St Kilda at Etihad Stadium, gathering a career-best 36 possessions. 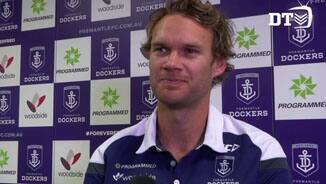 He was the only Fremantle Docker to play all 22 games and two finals in 2010.